We are two years removed from the horrific flooding that caused the Thailand Drive Crisis that created a worldwide shortage of hard disk drives. Prices for hard drives spiked and have remained stubbornly high, only returning to pre-crisis levels in the last couple of months. The market and competitive forces that over the past 30 years have predictably driven the cost per gigabyte of storage down took a vacation. 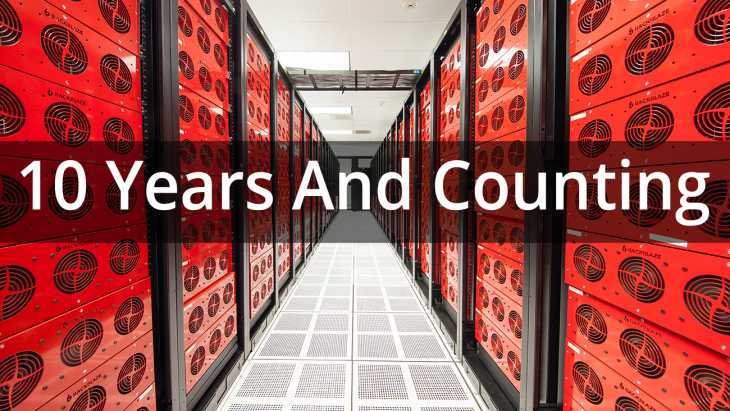 During these last two years Backblaze faced an additional $1 million in data storage costs if we went with the status quo. We didn’t. Instead here’s what we did. In the last 30 years the cost for a gigabyte of storage has decreased from over $1 million in 1981 to less than $0.05 in 2011. This is evidenced by the work of Matthew Komorowski. In addition, the cost per gigabyte also declined in an amazingly predictable fashion over that time. Beginning in October 2011 those 30-years of history went out the window. Since starting our service, Backblaze “worked the curve” to keep our costs low as we committed to providing unlimited online backup for just $5/month. We started building our Storage Pods with 1TB drives moving to 1.5TB, then 2TB, and then 3TB drives as the cost per gigabyte dropped from $0.11 to a little over $0.04 a gigabyte for the hard drives we purchased. 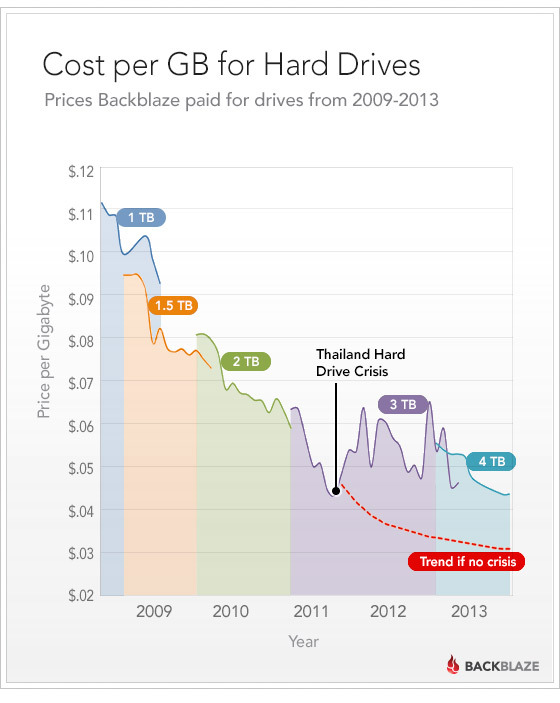 All that changed in October 2011 with the onset of the Thailand Drive Crisis as seen below which depicts the cost per gigabyte that Backblaze paid for the hard drives we purchased. Status Quo — This would be the cost to Backblaze if we ignored the drive crisis and continued to do the same thing we were doing. For example, buying the same hard drives from the same manufacturer regardless of the price. Reality — This is our cost per gigabyte based on our actual purchases. Historical — The expected cost as if nothing had happened and the cost per gigabyte continued downward at or near the historical rate. The chart below visualizes these three states over the time period of the drive crisis. Prior to the drive crisis Backblaze almost exclusively purchased Hitachi 3TB Internal drives (Model: 0S03230). In September 2011 we could get these Hitachi hard drives for about $130 each ($0.044 per gigabyte). In November 2011 our cost for the same drive was $249 each ($0.083 per gigabyte), 88% higher, and they were really hard to find. Availability and prices varied over the next several months until the model of the Hitachi drives we were buying disappeared entirely with no suitable substitute from Hitachi. 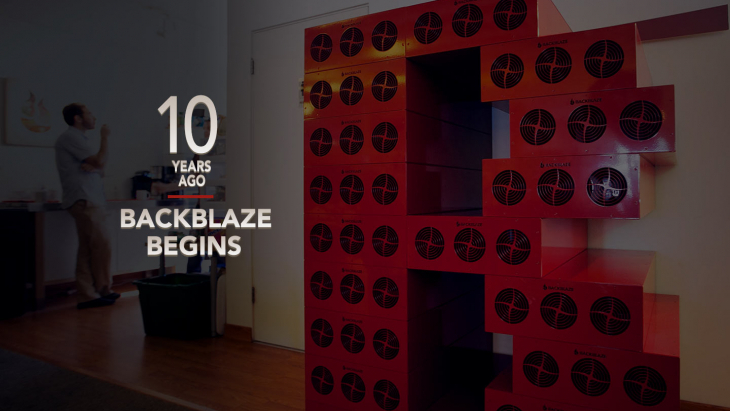 Beginning in October 2012, Backblaze transitioned from using 3TB drives to using 4TB drives in our Storage Pods. As in the past, moving to a higher density drive leads to a temporary increase in the cost per gigabyte of the hard drive cost. 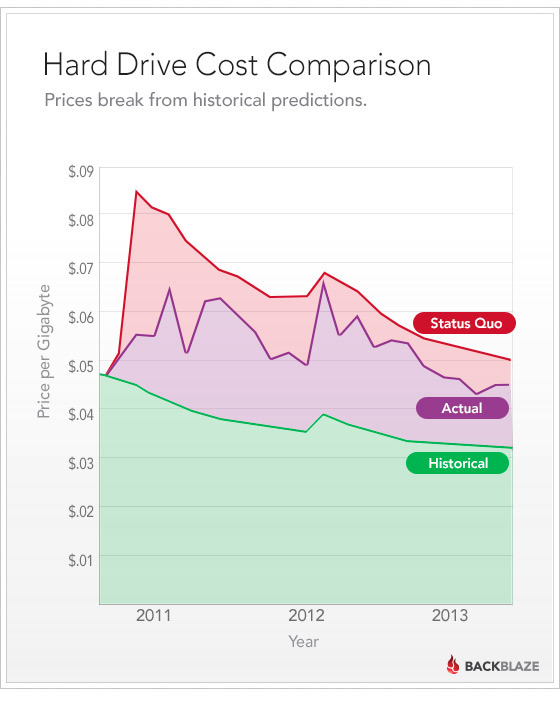 The switch to 4TB drives is seen as a jump in cost per gigabyte from October through December 2012. The “Reality” line of the graph is our actual purchases. When Hitachi drives got too expensive we switched to Seagate and Western Digital. When internal drives got too expensive we turned to external drives. When hard drive availability became an issue we turned to Drive Farming. Using the data from the chart above we can determine the costs for the “Status Quo”, “Reality” and “Historical” trend lines from October 2011 through September 2013. 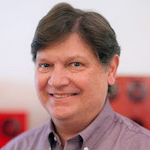 Switching hard drive manufacturers from Hitachi to Seagate and Western Digital. The assumption here is that all drives are the same and as we’ve learned that’s not really the case. Buying and “shucking” external drives instead of higher priced internal drives. 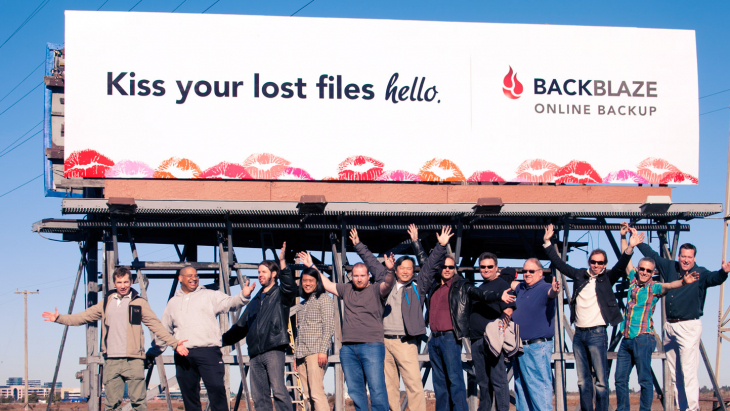 Having our friends, family and customers become Backblaze Drive Farmers. 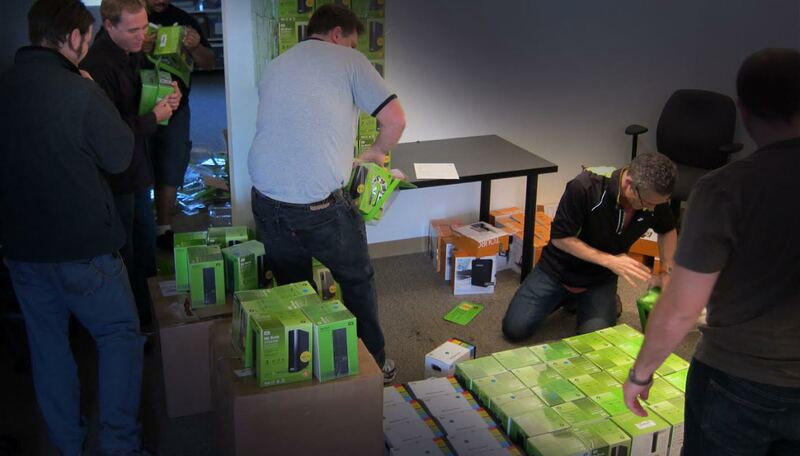 Raise Prices — This was the response of most companies that use hard drives in bulk. Throttle Upload Speeds — Less data going to the data center means less storage. 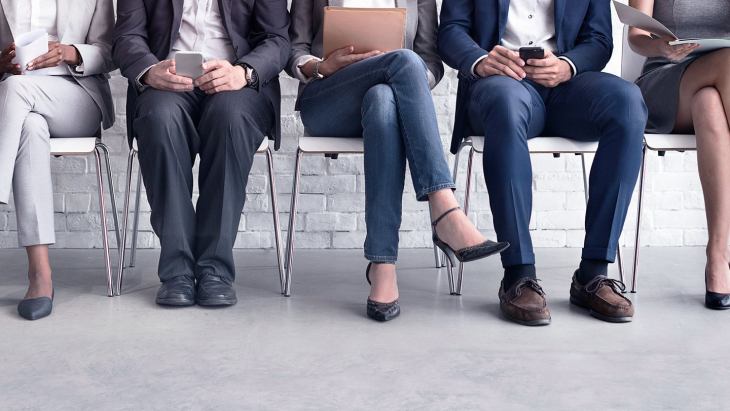 Freeze or Limit Signups — A lottery for new customers or maybe no new customers at all until things got better. In the end we did “none of the above”, instead choosing to shoulder the responsibility ourselves by doing drive farming, “shucking” external drives, and changing drive manufacturers to so we could keep with our commitment to $5/month unlimited online backup. As we noted earlier, our price per gigabyte is finally about the same as it was before the Drive Crisis. You can see from the chart below that the trend line for the 4TB drives we are now using seems to align with the drives purchased outside of the Drive Crisis period (Oct 2011-September 2013). Since a majority of the drives we purchased during the Drive Crisis were 3TB, that trend line clearly shows the detrimental affect the Drive Crisis had over that two year period. When the Drive Crisis started, industry pundits estimated that the hard drive market would take anywhere from 3 months to 1 year to recover. No one guessed two years. Was the delay simply an issue in rebuilding and/or relocating the manufacturing and assembly facilities? 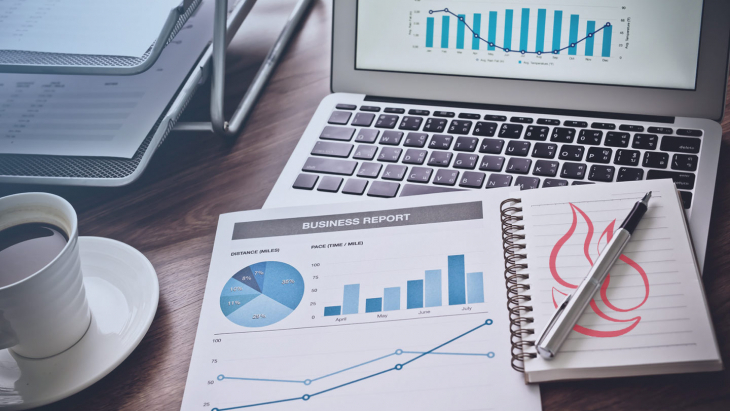 Did the fact that the two industry leaders, Seagate and Western Digital, had to integrate large acquisitions slow down the recovery and subsequent innovation? 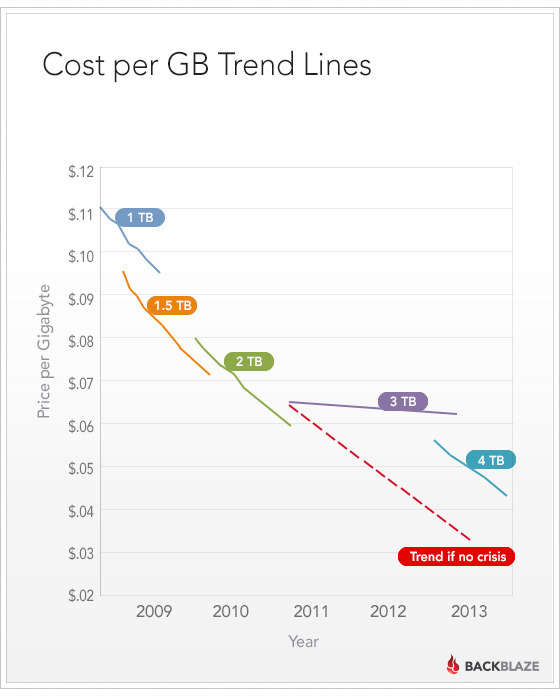 What about the dramatic shift towards tablets and away from Desktops and Laptops, has that changed the hard drive market and the declining cost per gigabyte trend line forever?